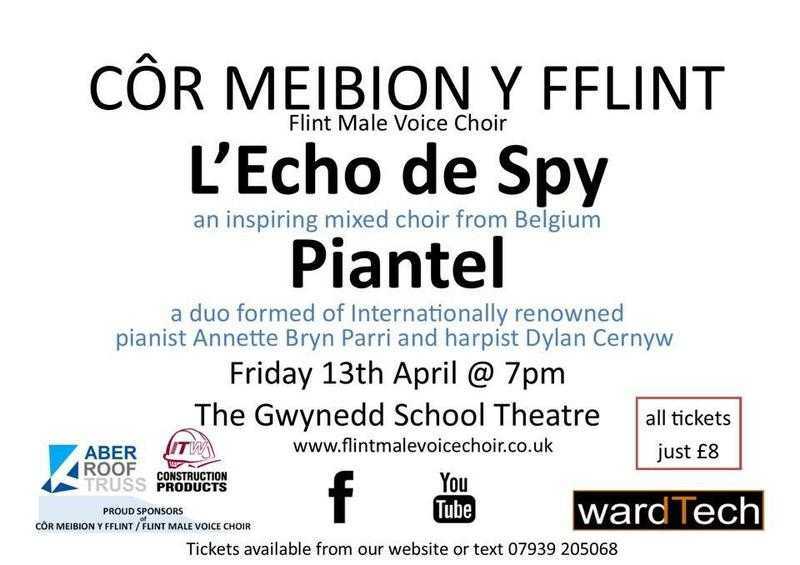 Home › Wales › Community › Rideshare › Gala Concert Flint Male Voice Choir and Co.
Gala Concert Flint Male Voice Choir and Co.
Echo de Spy, a 50 strong mixed Choir from Belgium and Piantel a sensational duo of Pianist Annette Bryn Parri and Harpist Dylan Cernyw of the ultimate quality. Echo de Spy are an enthusiastic mixed choir from Namur, Belgium and led by the talented Bénédicte Willems. Piantel consists of Pianist Annette Bryn Parri and Harpist Dylan Cernyw who have been performing as soloists on piano and harp for many years. In 2005 Annette & Dylan decided to combine their musical talents to bring you Piantel. In their time together they have achieved success with a varied and wide range of experiences. Both Annette and Dylan are extremely well known all over the country for their individual style and performances, accompanying and performing alongside some of our biggest stars: Bryn Terfel, Katherine Jenkins, Hayley Westenra, Rhys Meirion, Shan Cothi, Gwyn Hughes Jones, to name just a few! Between the two of them, they have recorded five solo albums with their record company ‘Sain’ and three ‘Piantel’ albums and they have both appeared on many more recordings as accompanists. Their latest album called “Un Enaid” (One Soul) was released in September 2012. Engagements have included recitals at the Edinburgh Fringe Festival in 2005, 2006 and 2007 and performances alongside Hayley Westenra in June 2006 at Venue Cymru, The National Eisteddfod of Wales Pavilion on many occasions and The Royal Albert Hall in London. As well as stage performances they have appeared on many BBC broadcasting TV programmes as well as live radio shows.